She Writes Press, 9781631523205, 256pp. 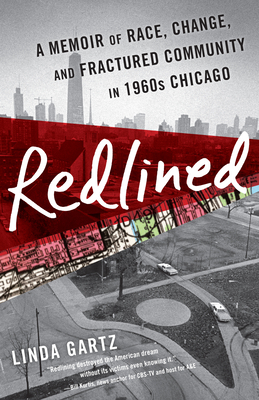 Set against the backdrop of the Civil Rights Movement, Redlined exposes the racist lending rules that refuse mortgages to anyone in areas with even one black resident. As blacks move deeper into Chicago's West Side during the 1960s, whites flee by the thousands. But Linda Gartz's parents, Fred and Lil choose to stay in their integrating neighborhood, overcoming previous prejudices as they meet and form friendships with their African American neighbors. The community sinks into increasing poverty and crime after two race riots destroy its once vibrant business district, but Fred and Lil continue to nurture their three apartment buildings and tenants for the next twenty years in a devastated landscape--even as their own relationship cracks and withers. After her parents' deaths, Gartz discovers long-hidden letters, diaries, documents, and photos stashed in the attic of her former home. Determined to learn what forces shattered her parents' marriage and undermined her community, she searches through the family archives and immerses herself in books on racial change in American neighborhoods. Told through the lens of Gartz's discoveries of the personal and political, Redlined delivers a riveting story of a community fractured by racial turmoil, an unraveling and conflicted marriage, a daughter's fight for sexual independence, and an up-close, intimate view of the racial and social upheavals of the 1960s.